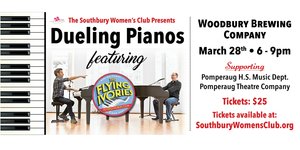 The Southbury Women’s Club is sponsoring a Dueling Pianos charity event featuring the Flying Ivories on Thursday, March 28th from 6:00pm to 9:00pm at the Woodbury Brewing Company on Main Street in Woodbury. The Flying Ivories are professional entertainers from New York City that lead this interactive musical event. Two performers on two pianos deliver an all-request, rock and roll sing-along as they battle each other to deliver the best song of the night! From Billy Joel to Aretha Franklin, from Sinatra to Metallica, from Garth Brooks to Madonna, they’ve got it covered. Got a favorite song? Put a tip in the jar and override the song currently playing to hear your tune. Proceeds from ticket sales along with the tips from this event, which the Flying Ivories is donating back to SWC, will go to benefit the Pomperaug High School Music Department and the Pomperaug Theatre Company. Doors open at 6pm, show starts at 7pm. Must be 21 years old and over. Tickets are $25 apiece and can be purchased through www.southburywomensclub.org. The show includes a complimentary sweet and salty snack bar.